Clairaudient experiences are one of the ways in which our Higher Self (soul), Spirit Guides, angels, and departed loved ones communicate with us. 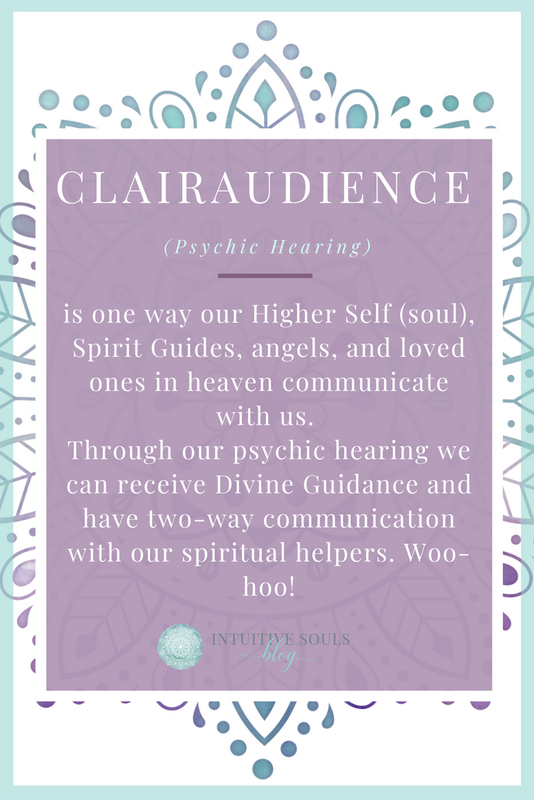 Through our psychic hearing, we can receive guidance, and even have a two-way communication with our spiritual helpers! But how do you know you’re connecting with the Divine? 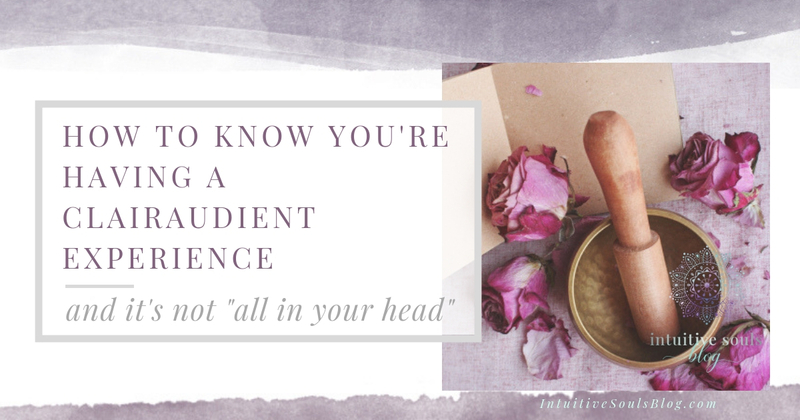 How do you know it’s not just “all in your head”? That’s what we’re going to uncover today. Many people doubt they’re clairaudient simply because they think this gift is much more dramatic than it actually is. In reality, clairaudient experiences are usually very subtle. When my son’s guitar is not fine-tuned, I can’t tell… but he can. His ear is trained to recognize the subtle distinctions in tone. Developing clear hearing is a lot like learning to tune a guitar by ear. With practice and an awareness of what to “listen for”, you’ll be able to recognize when you’re having a clairaudient experience, too. I’m not gonna lie – it’s pretty awesome! What about when clairaudience isn’t so profound? Remember, most clairaudient experiences are subtle. What if you want to be able to tune into your intuition and your Spiritual guides regularly? That could be a super-helpful tool in life, right? When you’re aware of what to look for, you’ll see that it’s not that difficult to distinguish between clairaudience and your logical mind. As with all psychic development, it just takes a bit of practice and patience. I like to think of clairaudience as a telepathic messaging system. It’s like using your cell phone without ever having to pick it up! The key is to become aware of how clairaudient experiences manifest. As you’ll see, it’s a bit different from your thinking mind. Usually sounds like your own voice (like when you are thinking or reading to yourself). Always for your highest and best good. This is because the primary energy of Spirit is love. Spirit would never tell you to do harm to another, get revenge, etc. The soul is compassionate and forgiving. Does not impose on your free will. While you can receive Divine guidance if you ask for help, Spirit will never tell you what to do. Choices are always yours. May feel like auditory impressions or like a thought “popped” into your head. For example, if I’m brushing my teeth and thinking about my grocery list and suddenly have a memory of my grandfather in heaven – I KNOW he is communicating with me telepathically. Why? Because it’s a completely different thought from the one I was having. It’s also heard internally, and uplifting. See how subtle clairaudient experiences can be? Can be short, especially when your clear hearing is just unfolding. You may hear hear a snippet of music, a word, or a phrase. As you develop this ability, you will be able to have a longer, two-way dialogue with your Spiritual team. Tip: Set up your own psychic development board on Pinterest. Simply hover over the image and save. Voila! I’m a clairaudient and clairsentient psychic medium. Those are my two strongest intuitive abilities. If I am doing a reading for someone, I will hear things like names or phrases from Spirit. I usually hear them in my voice. Sometimes, I hear them in Spirit voice. And in my everyday life, I listen to my intuition to help me navigate through each day. It helps me with setting priorities, making decisions, and live life in the most joyful way possible. I rely on my clairaudience as much as my physical senses. You don’t have to be a psychic to have an experience with clairaudience. You’ve probably heard stories about someone being kept from harm because they heard a warning. I guess hanging out with a psychic wife has rubbed off on him, because he listened to this guidance. Minutes later, their truck was slammed from behind by a speeding driver. Thankfully, everyone was OK. I have a friend who had an ah-maz-ing clairaudient experience. She heard the words he’s the one when she was introduced to the General Manager of a company. As corny and unbelievable as it sounds, she was super excited because she KNEW she received a message. She was right. Two years later they were married! Maybe you had a similar experience. And maybe it was easy to know that this was your intuition or Divine intervention because the message appeared suddenly, clearly, and was a little louder than your regular thinking. 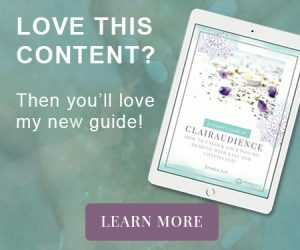 I hope you’ve enjoyed this series about clairaudience. I had so much fun writing it! I hope you are excited to start developing this wonderful intuitive gift! Great post, I would like to ask you a question about this. I have had some clairaudience come through voices inside that let me just know things about my ex his name begins with B. Another time the voice came from very close to my ear on the left side like a whoosh of sound it said “your going to marry B” the voice immediately made me feel calm, when I asked another psychic forum it told me when the voice comes from outside it can be an earth bound spirit making mischeif.and not to trust it, I haven’t married any B yet but another psychic told me my ex would be coming back. I think the voice outside was a good voice because it made me feel calm what do you think? Hi Jessica, I’m so happy to have found this post this morning. Clairaudience is kicking in enough for it to now be stopping me from sleeping! I’m sure it is what it is because although I’m good at thinking the rate at which the words are coming into my head is like it’s coming fom somewhere else. I wasn’t sure what it would sound like and was reassured to read that it sounds and feels like your own voice. I’m not sure what happens once it starts I suppose it’s just a matter of waiting and seeing though between 1and 4 AM wouldn’t be my chosen time to receive information! This experience might have happened to me twice this month. Within a two week period (18 days apart). Both times it started out as a high-pitched sound. Like the buzzing sound a mosquito makes. That’s the only way I can describe it. Then I hear indistinct or muffled voices inside my head. As if the radio or TV was playing low in the background. But the weirdest thing, is that the whole time I’m wearing silicone earplugs. When I take them out, the sounds I hear suddenly end. Just like that. As I said, it happened only twice this month. Usually when I’m about to drift off to sleep. Which is kind of annoying because then I can’t sleep. The difference between the first and last time I heard it was that, the first time was lengthier than the second time. Both instances I took out my earplugs from my ears and the sounds immediately stopped. I cannot understand what’s going on exactly. Not sure what to think at this point. There’s no other explanation for these sounds I’ve been hearing. The fact that there were voices talking nonsense into one of my ears. Almost like someone was whispering closeup has really baffled me. None of it made any sense. Just gibberish to me, similar to not understanding a different language. It was simply noise for the sake of noise. Very vague and weird to be honest. All that while wearing earplugs the whole time. Seems a clairaudient experience could be the explanation I was looking for, if only to make sense of things. Hi I’m really new to this but two months after my maternal grandmother had passed I was waking from sleep when I clearly heard her tell me to take a pregnancy test. It was like she was there with me, it didn’t startle me but I took a test anyway and I was pregnant with my son, who incidentally was due round her birthday. My paternal grandmother passed September I was extremely close to her and have missed her terribly. I was up early hours just this morning was just about to drift off back asleep when I clearly heard her laugh. No words just laughter, but in my head it was her telling me she is fine. I’m not sure whether this makes me clairaudient or whether it’s something that I need developing. Oh no, I don’t think you’re crazy at all! Thank you for the sweet and honest comments :) It sounds like you are finding your way. Yay!